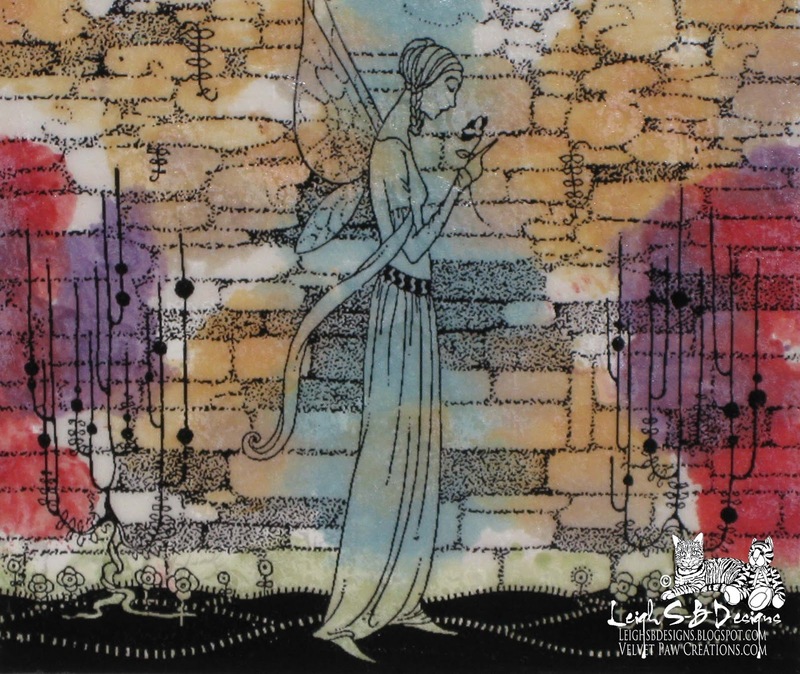 Velvet Paw Creations: Colourful French Fairies with Smeared Ink! We're now into the 2nd week of Smudgy Antics "Make It Colourful with a twist" challenge! The twist is you can't use markers or pencils! Of course there's plenty of ways to make your projects colourful and the Smeared Ink design team has you covered with some fantastic ideas and here's mine using Distress Stains and transparencies! 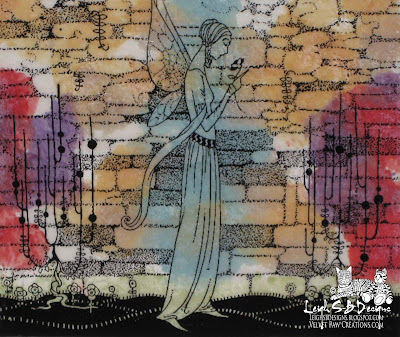 I used one of Smeared Ink's French Fairies digi images and printed it out onto an ink jet transparency sheet. To protect the printing I adhered it to another sheet after running it through my Xyron to add permanent adhesive. 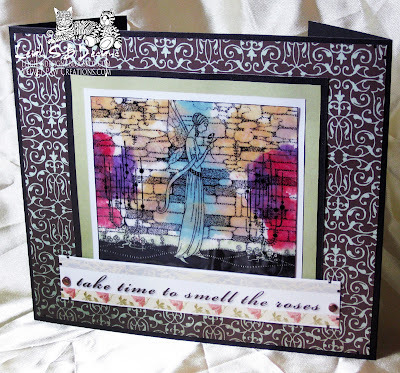 Dab Tea Dye, Pumice Stone, Fired Brick, Dusty Concord and Stormy Sky Distress Stain onto a sheet of glossy white cardstock and press the French Fairy transparency down on it so you can see where the stains are and allow them to smear around. Remove the transparency once you're happy with the result and clean the stain off the transparency with paper towel. While the stains dry on the glossy paper run the transparency image through the Xyron again to add more adhesive and adhere it to the glossy cardstock. Use a Perfect Layers tool #1 to trim leaving a 1/8" border. 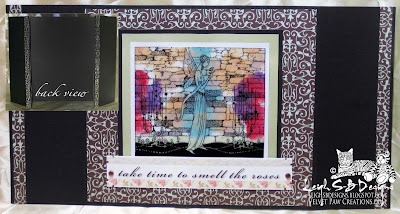 Adhere it to a sheet of dirty greenish-blue paper (My Mind's Eye) and use the same Perfect Layers tool to cut a 1/4" border. 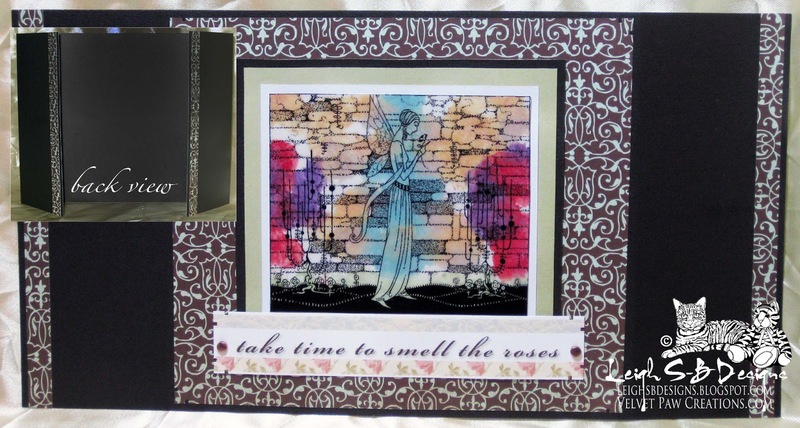 Adhere to black cardstock and use P. Layers tool to cut a 1/8" border. Then adhere it to a sheet of patterned cardstock and use P. Layers tool #3 to create the 1 inch mat. 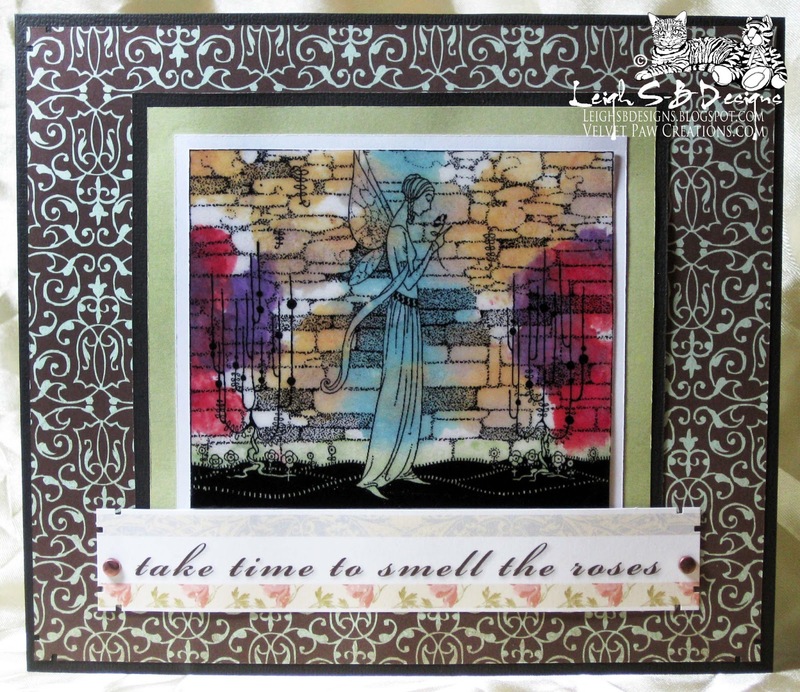 Punch decorative corners on the patterned paper mat with a Marvy paper punch and finally adhere everything to a sheet of black cardstock. Score fold lines down the left and right edges and trim the top and bottom of the black cardstock to form the fancy fold card base. 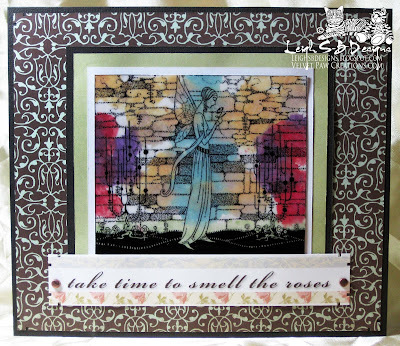 Trim a repetitive sentiment border (CardMaker) down to size and punch the corners with the same decorative design. Adhere the sentiment border to the card with a dab of glue and punch tiny holes in both sides and attach it to the card with tiny copper brads. Complete the card by adhering two off cut strips to the left and right flaps to jazz up the back of the card too. I've got two more French Fairy cards to share so stay tuned but in the meanwhile pop over to Smudgy Antics and take the challenge for the chance to win a $5 Smeared Ink gift voucher! This is soo beautiful! The details! Wow! Love it! What a beautiful project!! !Thanks for joining us at Sparkle N Sprinkle Creative Challenges this month. Lovely card! Thank you for joining our challenge at Digisketch Challenge! What a lovely card! great job! Thanks for joining the SNS challenge!